A detail from Plein Air by Gerry Davis. 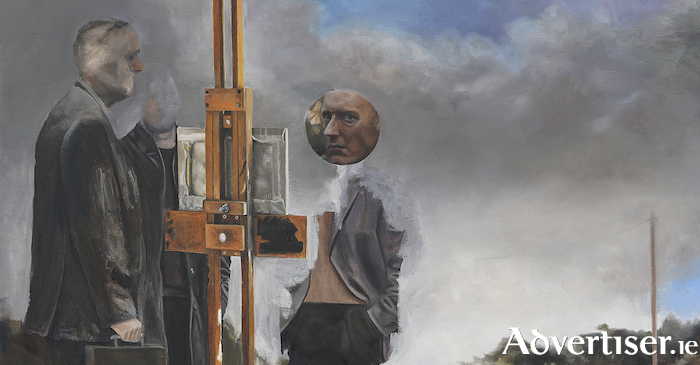 A DREAMLIKE journey through memory, identity, and the obstacles encountered by a contemporary practising artist, make up the paintings on display in Procession, the new exhibition by Gerry Davis. Procession displays work that Tipperary born, Limerick based, artist Gerry Davis has produced since 2017. The premise of this exhibition is one of exploration of identity, the "shoulds" and "oughts" of artistic practice, and an attempt to arrive at a destination. Several paintings suggest a fictional narrative with imagery of plein air painting: an artistic congregation, a bonfire, a mysterious journey to a colossal platform. Others are more autobiographical: a dreamlike recalling of his wedding, or a figure pulling weeds from a grave. Davis has been a member of Wickham St Studios in Limerick and has had solo shows at TACTIC in Cork and The Source Arts Centre, Thurles. He won a merit prize twice at the Golden Fleece Award and in 2016 won the Hennessy Portrait Prize at the National Gallery. This resulted in his being commissioned to paint Kilkenny hurler, Henry Shefflin, for the NGI’s Portrait Collection.